Could Samsung be readying a Surface Book killer? Samsung looks like it's going to have a fresh spin on a Windows 10 hybrid in the pipeline, at least if you go by an app which was spotted on the Windows store. The app in question is produced by Samsung for a device called the 'Galaxy Book', and the name itself suggests a convertible or detachable-style PC in the vein of Microsoft’s Surface Book (except hopefully considerably cheaper – well, it could hardly be more expensive). Aside from the moniker, the software, which is called 'Book Settings', gives us a few more clues about the potential device – it’ll have an active stylus, as you’d expect with such a hybrid, along with an AMOLED screen and ‘pattern login’ (drawing a pattern to unlock the machine). There is also references to a ‘battery life extender’ feature, which limits the maximum charge level to 85%, in an apparent effort to give the battery more staying power when it comes to fighting the loss of overall capacity which inevitably occurs as time marches on. Of course, the compromise is that you’ll have less actual battery life when out and about (without a full 100% charge). Hopefully we can expect some more neat tricks and features besides – if the Galaxy Book does indeed exist. Remember, at the moment this is just an app which has been released, although the fact that it’s already on the Windows store is a positive sign. As MS Power User – which spotted the app – reports, Samsung already has a trademark for the Galaxy Book which goes back to 2012. 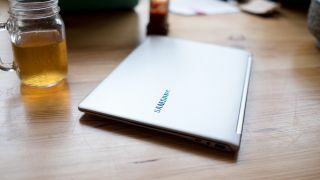 Naturally, the company has existing 2-in-1 efforts out there, such as the Samsung Notebook 7 Spin, which is a hybrid of the 360-degree hinge variety (i.e. you can fold the screen all the way back to be flat against the keyboard, for use like a thick tablet). AMD vs Intel: which chipmaker would power a better 'Galaxy Book'?